On Monday 22 February, the Environment Agency will begin repair work on a section of the Frankwell flood defence scheme in Shrewsbury. The repairs will involve relaying part of the outer brick wall cladding and installation of a new coping stone along a 170m section of wall adjacent to the Bowling Green. The works, which are expected to take approximately 2 weeks, will ensure that the wall does not pose a health and safety risk to members of the public using the area. There is no change to the standard of protection offered by the flood defence and the repairs taking place are mainly for aesthetic and public safety purposes. Heavy rainfall is forecast this coming weekend which may result in rising river levels along the River Severn in Shrewsbury. In the event that the demountable flood barriers at Frankwell are required, the repair works will not affect any aspect of the deployment and the flood defence will still continue to perform normally and effectively at times of flood. Shropshire Council has offered the Environment Agency free use of Frankwell Main Long Stay car park for the duration of the works for those people directly impacted by the works. Shrewsbury Town Council has also allowed the use of their land for Environment Agency site works. The outer layer of our flood defence takes the majority of the wear and tear over time. Even though this outer layer does not provide the flood protection, we want to make sure it is in keeping with the surrounding area and is in a good, safe condition for members of the public using the area. We are really pleased that Shropshire Council and Shrewsbury Town Council have provided free use of their car park and land during the works. It is great that we can work together to achieve more for those living in and visiting Frankwell. I’m delighted that we have been able to help our colleagues at the Environment Agency by providing free parking for those affected while this essential repair work is carried out. The money that the Environment Agency would have otherwise spent on parking can now be put into the repair work, and ensure that additional and more comprehensive work can now be carried out. This means that a longer stretch of wall can now be treated, and that this stretch of wall will be even more secure and much safer, and for much longer. Shrewsbury Town Council looks forward to working in partnership with all agencies to ensure the works are completed as quickly as possible and that any inconvenience to our customers and visitors to the town is kept to a minimum. The Frankwell flood alleviation scheme reduces the risk of flooding from the River Severn. 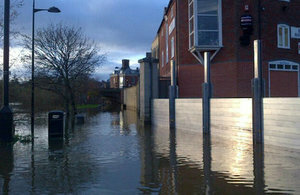 The scheme consists of a series of permanent flood walls (700m) and demountable slats (155m) along the north bank of the Severn as it flows to the north of Shrewsbury Town Centre.